Ok, so it’s been a few months since I posted my HDR tutorial, and in that tutorial I said that I would eventually amend it with my Photoshop process. Well, here it is! 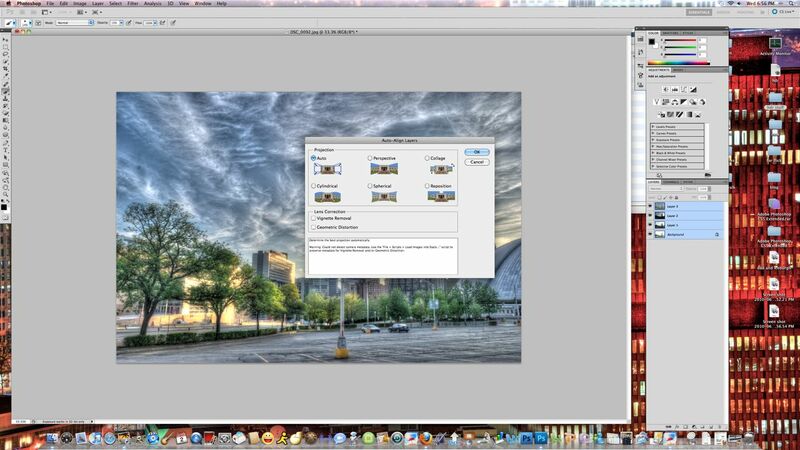 I’ll take you through my typical workflow after the HDR image is created, with my most commonly used processes. I may make some variations picture to picture, but in general, this is the final output of my HDRs! So if you remember back to the HDR tutorial, you will recall how I mentioned about haloing. This is a dreadful albeit inevitable effect that you get in HDRs when areas of high contrast meet, typically between the sky and anything on the horizon, i.e. buildings, trees, people, whatever. While you are still processing the HDR in Photomatix there are a couple of ways to reduce these, which I touched on in the tutorial. The first way is to keep the strength low, usually below 30 for me will get rid of the halos, and makes sure that the luminosity is as far to the right as you like (min never comes off 10). Now, as we learned in physics class (or one of those science classes back in high school) for every action there is a reaction (sometimes equal and opposite, sometimes not!). In this case, the action was to lower the Strength slider. The reaction is that you get a much “flatter” HDR, in terms of how I process mine. If you are going for a much more natural look, by all means, lower the Strength all day long! For the way that I like my pictures to look however, this doesn’t work. I typically keep the Strength between 40 and 60, and this will inevitably bring out the halos. For those of you who like to really cook your HDRs, this tutorial will help get rid of some of those halos for you as well. Ok, so we have our scene with a high dynamic range of light, we took our exposures, we processed in Photomatix, we like the result, we have some halos. 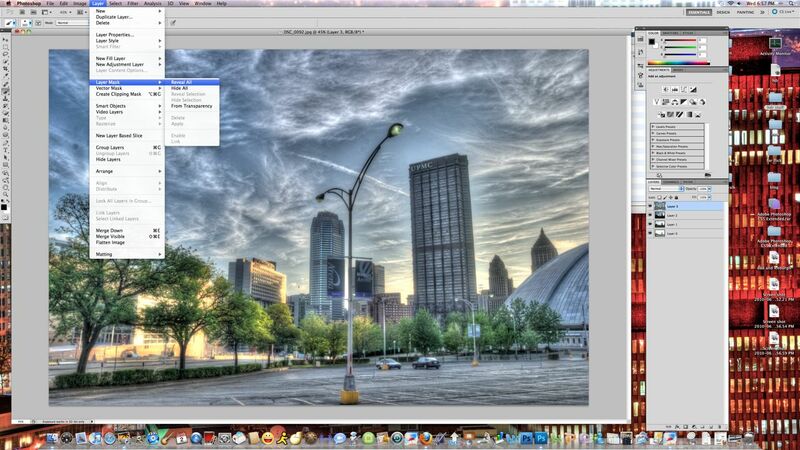 You can see the tonemapped HDR as well as the settings that I have used below. To Photoshop we go! 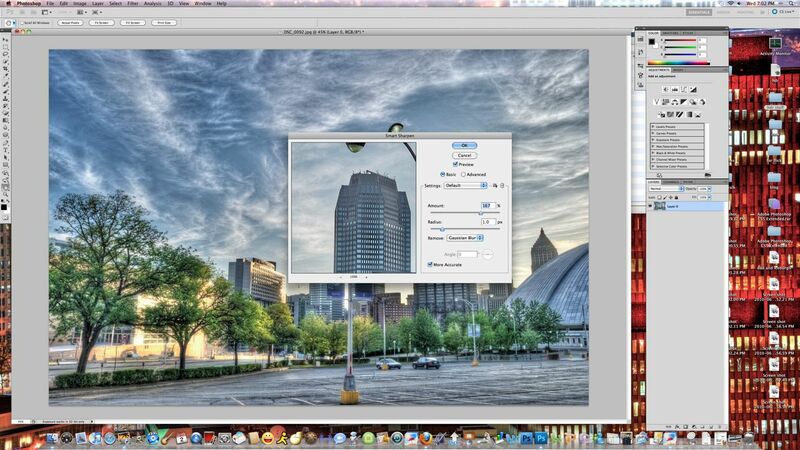 I will be doing this tutorial in CS5, however the same steps can be followed in CS4 and earlier versions as well. 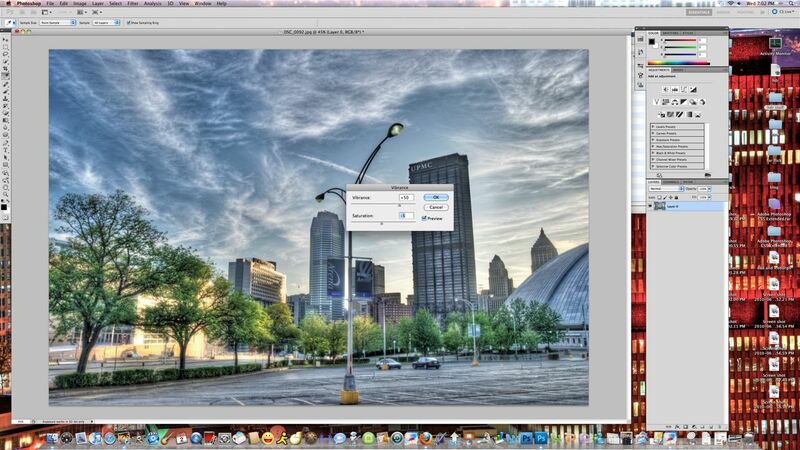 The first step that we want to do is bring in the HDR and three of the original exposures. I like to use three; some people tell you that you need to bring in one; some people tell you that you need to bring in all the original exposures. My advice to you is to do whatever you find works best for your style. For me, that’s three shots. Anyway, below you can see the original HDR and the three exposures I brought in. 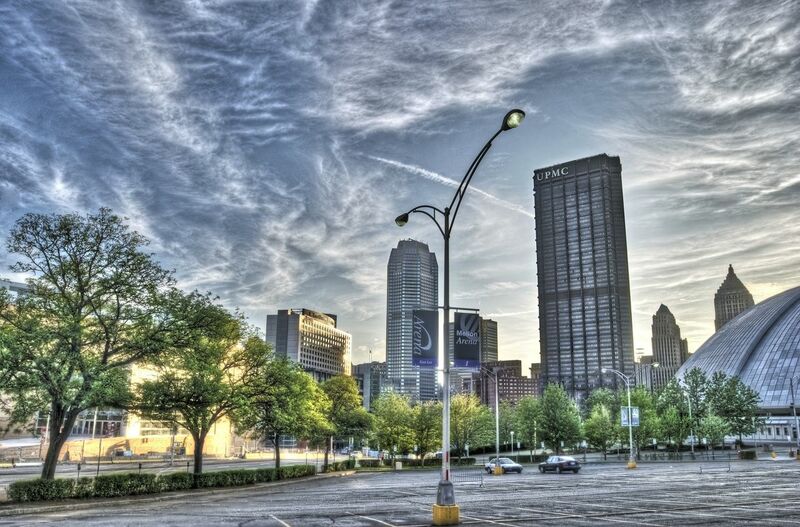 Notice the halos around the tall USX Steel Building in the middle, as well as the buildings on the lower right. My rationale behind the exposures I selected changes from picture to picture. I’m not going to tell you that you always have to take the middle exposure, and then +2 and -2, or whatever. 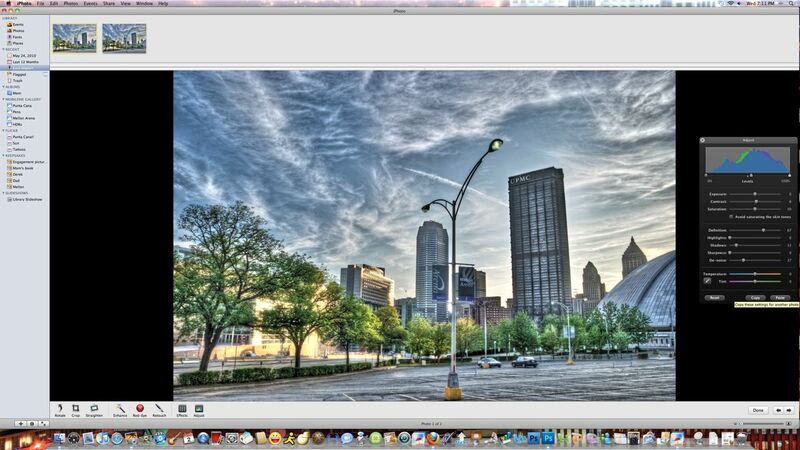 This is a 9 exposure HDR, and the ones that I chose were +3, +1 and -2. The reason I chose the +1 and -2 were because I wanted to make sure that I was able to eliminate the halos in different parts of the sky. The -2 was the one that properly exposed most of the sky, and the +1 exposed the sky on the left the best. The +3 was so that I could lighten up the USX Tower in the center, as well as the tops of some of the other buildings. Ok, now to the fun part. I copy and paste all the images on top of each other, leaving the +3 exposure as the background, as I will use the one to make the final touches. 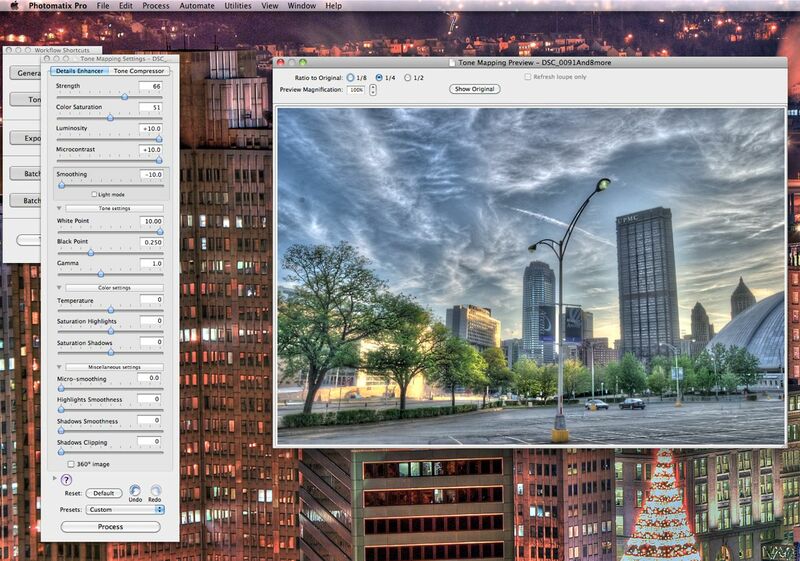 I go to Edit – Auto Align Layers and let Photoshop do its thing. After that’s finished I make a small crop around the edge to account for the alignment. With the top layer selected I select the brush tool (B), and go to Layer – Layer Mask – Reveal All. I usually keep my opacity set at 15% and my brush size to 360. Again, this is personal preference. I wouldn’t recommend going much lower, but you can certainly go higher if you’d like. I prefer to do my masking in small steps, not big ones. With the Brush Tool I then mask around all the buildings that I see halos. Don’t worry about going over part of the buildings. You can see from the image below that I have darkened the tops of some of them quite a bit. I use the -2 exposure to mask around the middle and right part of the sky, then merge that layer down using Command E or Ctrl E on a PC. I then do the same with the +1 exposure for the left part of the sky, masking out the halos around the trees. When you are happy that you have gotten rid of the halos to your liking, merge those layers together, and that leaves us just with the HDR and the +3. Since I have darkened the buildings with the masking of the sky, I need to lighten them back up. I will up my Opacity to around 25%, change my brush size to 160, and mask over the areas that I deem are too dark. Once that is to your liking, do one final merge down (Command/Ctrl E) and it is on to the rest of the process! The first step that I always do is to desaturate my shot a bit. 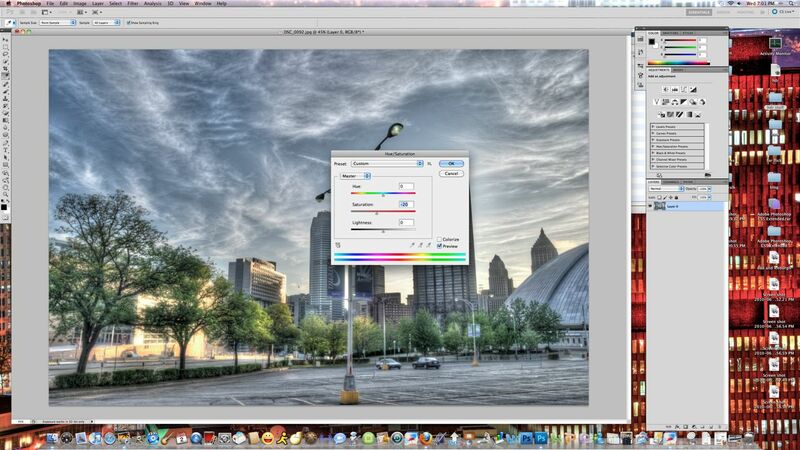 I go to Edit – Adjustments – Hue/Saturation and adjust the Saturation bar down to -20. This varies by HDR, but is a good starting point. I will then do a slight adjustment to the S Curve, Edit – Adjustments – Curves. I put an anchor point at the bottom left of the top right square and the top right of bottom left square. I don’t do a huge adjustment here normally, just enough to give me a bit of contrast. Usually I will adjust the shadows under Edit – Adjustments – Shadows/Highlights, just to brighten up the whole picture. This is usually a very slight adjustment, in this case, 13%. Next I will try to bring back some of the colors that I lost in the desaturation. I go to EditàAdjustmentsàVibrance, and my typical settings are +50 Vibrance and -5 Saturation here. I almost always use High Pass Sharpening on my HDRs, this one I happened to use the Sharpening filter. 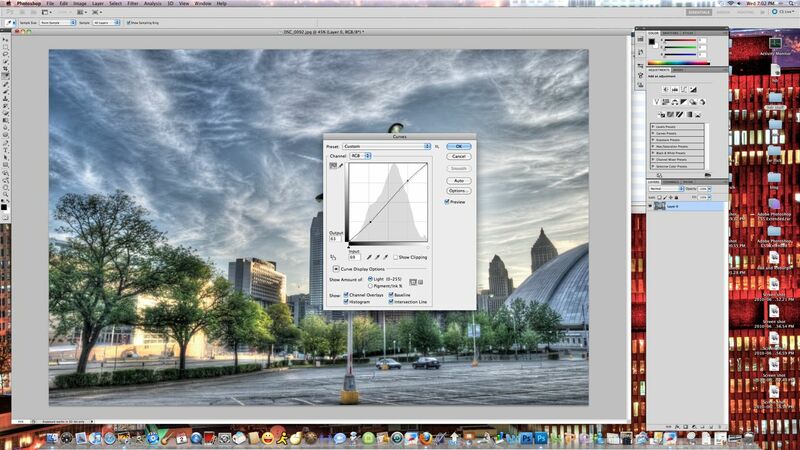 To do High Pass Sharpening is pretty easy. High pass sharpening in PS (which I use in a lot of my shots) – Duplicate layer and with that layer selected go to Filter – Other – High Pass, set to anyway from .5 – 5 (just so you can barely see the lines, hit OK, then select the blending option as “Overlay”. Works like a charm! For this one I simply went to Filter – Sharpen – Smart Sharpen, and set it to 167%. Again, adjust to your liking. The last step that I did for this one in Photoshop was a bit of an adjustment to the color balance to tone down the blues just a bit. You can see the settings below, I moved the top slider to +3 red and the bottom to -6 Yellow. Ok, done in CS5, one minor tweak left. I save and import the file into iPhoto, where I will up the Definition to at least 50, bump up the Noise Reduction to around 20, and the Shadows one more time 10. This step is optional, especially if you don’t have a Mac or iPhoto! So that’s it! Export to JPEG and upload to flickr/Blog/Faceook! I hope that this tutorial helped you out and that you were able to learn something that you didn’t before. If you have any questions about anything, please feel free to contact me! can hardly wait to try this out. Thanks a lot. Great tutorial! Amazing how everyone has their own workflow! I’ll definitely try some of these, thanks for sharing! I actually haven’t tried 4.0 yet, but I will have to give a shot when I get home. I will let you know what I think! Thanks again for this awesome tutorial. I do have a dumb question though. Since the purpose of the masking is to darken the halos and lighten other areas of the image, couldn’t I just use the adjustment brush in Lightroom 3 and darken the halos that way instead of having to create masks? I don’t have Photoshop and am trying to find a work-around. Geoff – Thanks for stopping by! I have only recently got into Lightroom, more or less withiin the last month, so you may very well be able to do that. I will give a shot and see if I get the same results! Please let me know if you ever have any other questions! great tutorial! a few ideas I will try. Thanks Dave. I have been quite frustrated with HDR and am hoping your tips will help me get going. Thanks for your comments and visits on Flickr too. but amazing effect … and ur doing all this with d40x … amazing!! !